NO NAVIGATION BAR AT LEFT? Schools ‘Admission, Progress, Withdrawal’ (APW) registers are an excellent resource for researching your family history - one of the few New Zealand resources which go some way to finding families and their movements within NZ. These records include Date of Admission, Pupil’s Name and Date of Birth, Parent/Guardian Name and Address, Previous School and Class on Admission, Standards passed within School, Last Day and Destination. Standard on admission, progress standards and leaving standard are not always transcribed. Pupil names for schools that we hold computerised transcripts for are included in the Master Index (see link at left) as are names of pupils in our photo collection. If you would like to contribute school photos to our collection, please contact us. Our photo collection is digital only so we regret we cannot accept original and/or framed photos. Please note that although we may hold APW records less than 80 years these names are not indexed on this site. For transcriptions please contact us at help.desk@balcluthagenealogy.org.nz Please include school name and pupil name/s wanted. We request reimbursement of costs (copying, P&P etc) and welcome a donation. The Hocken Library is the main repository for school records within the region. The New Zealand Society of Genealogists continues its nationwide project of transcribing school APW records. See ‘Links’ page for web addresses. 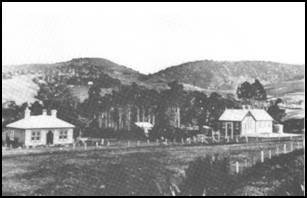 School washed away in 1878 flood.